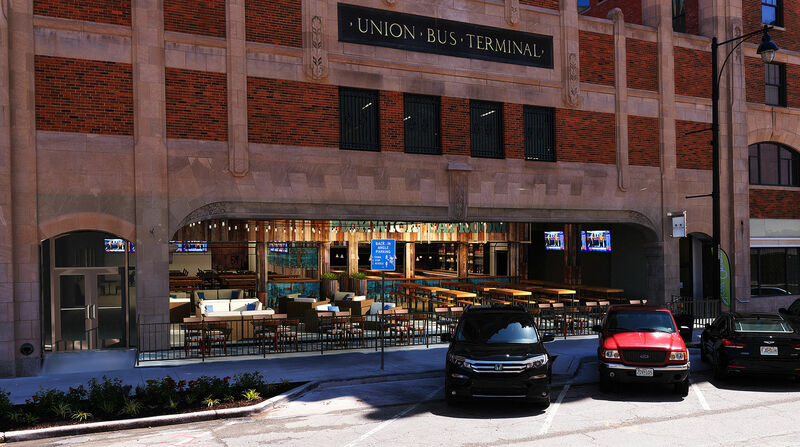 This is a great addition to Dow town KC that will bring life to a quieter part of the core. I am pumped to see this project come to life. If the stats are true, 70% of 260 apartments is roughly 200 new residents bringing more life and $$$ downtown. Great project! I've heard some rumors/seen some renderings for the main restaurant space here. Looks very cool if they can pull it off. That's not the wine bar corner? KCPowercat wrote: That's not the wine bar corner? No. The area under the union bus terminal sign. Last edited by WoodDraw on Wed Aug 30, 2017 12:32 pm, edited 1 time in total. That's CityGym and it's already open. I think the indoor pool is residents only though, although I could be wrong. 901 is the North tower entrance. 905 is the UPS store. Next is the flagship resteraunt space I'm talking about. 927 is under very heavy active work but I have no idea what's going in there. I'll ask unless one of you guys wants to search permits. And then the corner is the wine bar where I've seen no activity at all lately. There are also a few other spots open. The north corner looks like it's being used by the contractors. Still don't know how to post pictures here, but that's a concept rendering of what they were looking for the place. That's awesome. Could see that as a German beer hall type thing. Call up KC Bier co. Uh, that's incredible. I hope they're able to find someone to help make it happen. 10/10 would drink beer and eat snacks there. Yeah, one of them is even illegally parked. With the heavy caveat that I don't have tons of inside information and I don't speak for anyone involved, these developers are legit. A beer focused place was always the plan for that area. They didn't want to compete with the wine bar obviously. I'll share more as allowed. McGee through the downtown loop is more like an alley than a proper street. One of those slots is for the new car sharing and a few more are for electric charging. I agree they should go, but I'm skeptical. Also ups parking. Another spot taken up. A salon that looks like it's close to opening. Sorry for lots of edits. You can openly see into it now. I hear they'll be serving wine and probably be higher end. More the new trend than just offering basics, but don't quote me on too much of this. Last edited by WoodDraw on Wed Oct 18, 2017 7:33 pm, edited 2 times in total. There's a coffee shop going in here now too in addition to the makeup bar and facial place.